Required: Windows 10/8/7/Vista/XP and .NET 3.5 or higher. Portable version here. MIDI Transform is a simple and easy to use, yet powerful tool for transforming MIDI files. Especially unique to this web applet converter is the ability to force a MIDI into a minor, major, blues, or medieval mode, regardless of its original mode or key! This demo will allow 2 free MIDIs to be uploaded for experimentation. If you would like to upgrade to the full version, please pay $15 through either of the links below (credit card or Paypal). * Listen to these example MIDIs to see the possibilities with the mode changing feature! The author of MIDI Transform can be contacted here. 10/07/2017: v1.18 - Updated certificate signing 01/10/2015: v1.17 - MIDI files with extensive metadata failed to load. Problem is now fixed. 08/11/2014: v1.16 - Verified with certificate, and removed program obfuscation. 22/06/2013: v1.15 - Offline (download) version for Windows available. Also fixed filenames for non-friendly URL characters. 02/08/2011: v1.14 - Fixed loading of some MIDIs by 'ignoring' unknown/extremely rare MIDI commands. 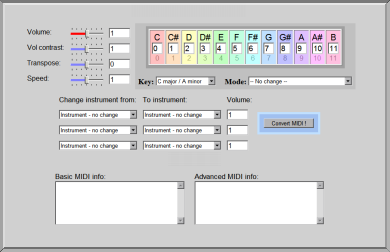 08/01/2011: v1.13 - A small bug prevented some MIDI files from changing instruments. Should be fixed now. 26/02/2010: v1.12 - 'Advanced MIDI info' section now displays track names. 17/09/2009: v1.11 - Fixed 'Mode' dropdown selection for latest browsers. You can now change (or turn off) the volume of the percussion. Rare MIDIs with special commands are now supported. Fixed a bug which prevented lowering the transposition of some rare MIDI files.